Drain spaghetti, place in a large bowl and add 1 Tbsp. olive oil. Stir using 2 forks. Sauté onion in 1/2 tsp. oil in a fry pan over medium-high heat for 2 minutes until golden. Stir in spinach and cook for 30 seconds. Add spinach mixture to spaghetti. Combine using 2 forks. In a small bowl, whisk together the eggs, parmesan, salt & pepper. Stir egg mixture into spaghetti using 2 forks. Using the same fry pan, heat 1/2 tsp. oil over MEDIUM heat. Swirl the oil around and spread the spaghetti mixture evenly into the pan. Cover and cook, undisturbed, for 3 minutes. 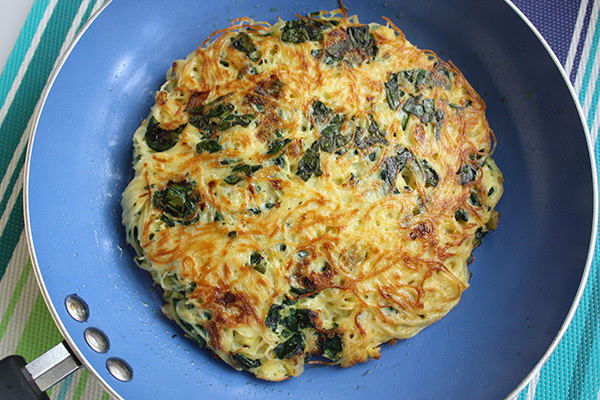 Remove frittata from pan, flip it over (see note below), swirl 1/2 tsp. oil around the pan, return frittata to pan, cover and cook another 3 minutes. Serve right away. To Flip the Frittata: Be sure to use a pan with sloped edges. Slide the frittata onto a dinner plate. Cover it with another dinner plate. Flip the plates over. Swirl oil around the pan and slide the frittata back into the pan. 19 Comments on "Spaghetti Frittata with Spinach"
Very yummy and easy. Thank you for another winner. This dish didn’t go over very well. Not sure what I did, but it’s not a keeper recipe in our family. I love your tasty, quick and simple recipes, makes life a bit more simple. Thank you very much for your recipes. I love the simplicity of each of your recipes and I think it’s great and selfless of you to share without giving your audience the unwanted ads or charging a fee. 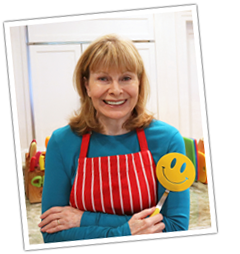 I’ve recently retired and have expanded my repertoire of recipes, so I look forward to receiving your recipes and your videos. Everyone loves pasta, it’s a winner. Do you have a video on it yet? So great to hear from you again. Please, please make more videos, absolutely love them,(I’m sure everyone else does too!). my husband made this for years. in our home it was called a “maltese omelet”. thanks for the jog in my memory. If you start frittata on top of stove and then pop it into a preheated broiler or hot oven to finish it you will not have to flip it. This is the restaurant style. Yes, but be sure your pan is oven safe. I am looking forward on making it. I already made the pizza in the cast iron pan. Looks like something I will love trying out. Thank you so much for all your work in giving us these recipes. What a meal saver this will be!!! Haven’t had time to make them, but they look delicious and so easy. I love to cook, but don’t want to spend hours doing so.